Here's one more Battle of the Five Armies set currently on shelves ahead of the release of the movie. 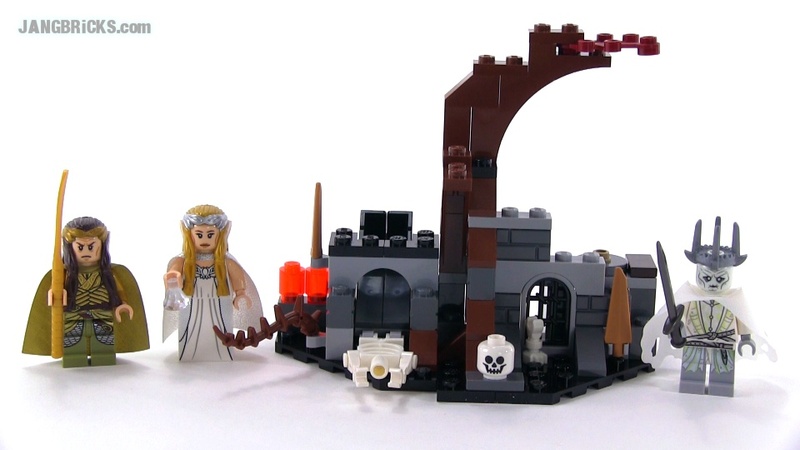 Take on the evil Witch-king at the fortress of Dol Guldur! Galadriel™ and Elrond™ have ventured to the evil fortress of Dol Guldur where they are attacked by the ghostly Witch-king. Help our heroes to battle this vicious crowned foe with the glow-in-the-dark head. Reverse the faces of Elrond™ and Galadriel™ and use Galadriel’s Elven magic and The Light of Eärendil to overcome his evil powers. Evade fireballs shot from the catapult and connect all the skeleton bones to create an extra figure! Use Elrond’s golden sword to duel against the Witch-king who is spinning on the rotating platform for extra power. Who will triumph in this tense battle between good and evil? You decide. Turn the lights out and watch the Witch-king’s head glow! Assemble the skeleton parts to create an extra figure and bring the dead back to life!